Cracked tooth root photos may seem a little grisly, but I hope they will help to explain what happens, hidden under the gum, when a tooth root is fractured under the gum. 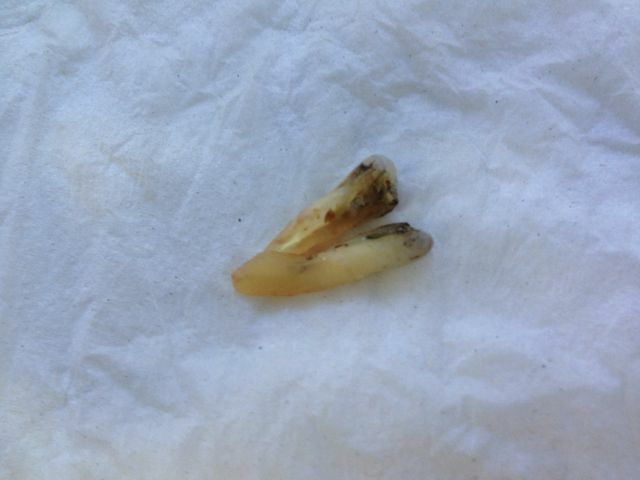 A cracked tooth root spells the end of the road for a tooth. Once the root has fractured, there is no way to repair it, and the crack is a perfect home for bacteria to breed. The symptoms of a cracked tooth root depend on how high (or low) the fracture line runs. If it is just under the gum, then you will notice some movement in part of the tooth. If you have a root canal crown (post crown) on the tooth, you may just feel as if the crown is working loose. Usually, there is some movement in the tooth, somewhere. BUT not always! Teeth will always do their best to fool you! 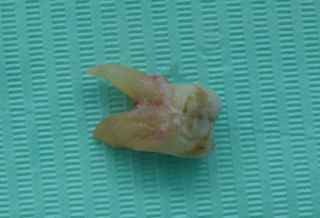 But if the fracture is higher up the root, well under the gum, then you will probably not notice any movement at all, but you will probably get a tender gum over the root, possibly with a small swelling or even a little bump on the gum. 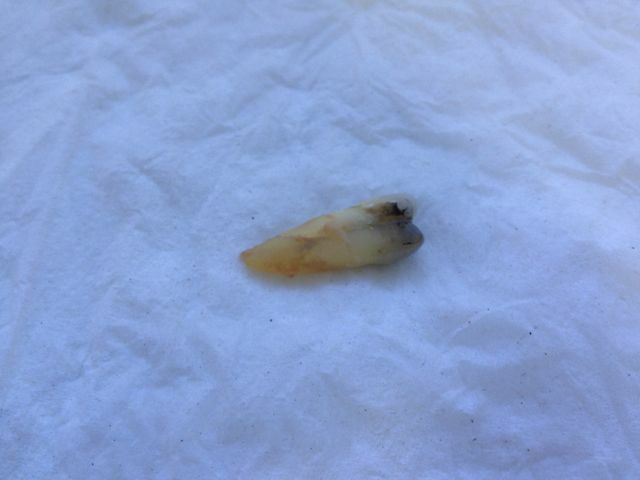 Here are some cracked tooth root photos that I took recently. 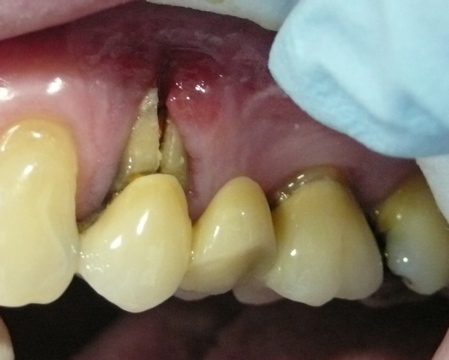 The gentleman had been having some problems with gum infections over the root. The X-rays did not show anything obvious. But I suspected a cracked root, due to the position of the little bump that kept coming up on the gum, despite several courses of antibiotics. The porcelain crown is the white bit to the right. 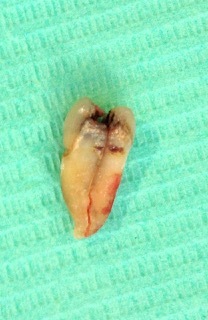 The root is the dark part of the tooth on the left side. You can probably make out a fine crack running through the middle of the root. Here, I have moved the tooth a little bit, and now you can see the crack more clearly. And now the extent of the fracture is obvious. 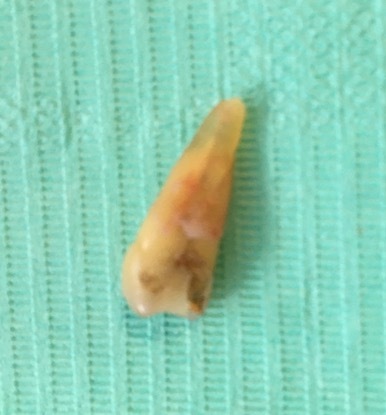 There was absolutely no hope of saving this tooth, which had a post crown (or "root canal crown") on it. 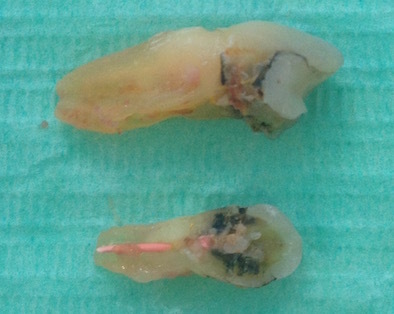 In this final photo, you can see what was hidden inside the root as I have turned the crown portion around to show the metal post inside the root canal. 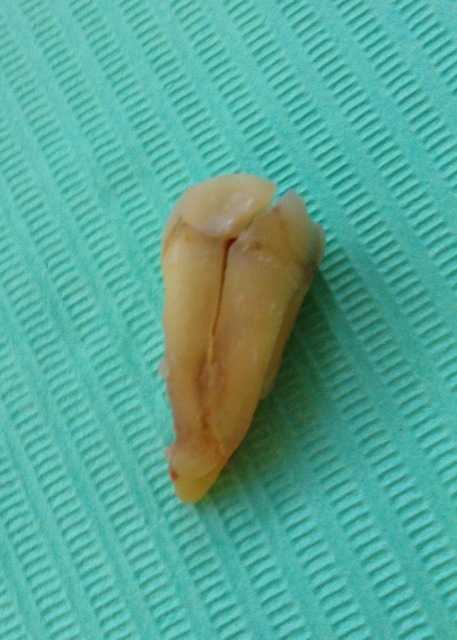 This tooth root had been fractured for around 9 months. In that time, bacteria had set up a long-standing, chronic infection. 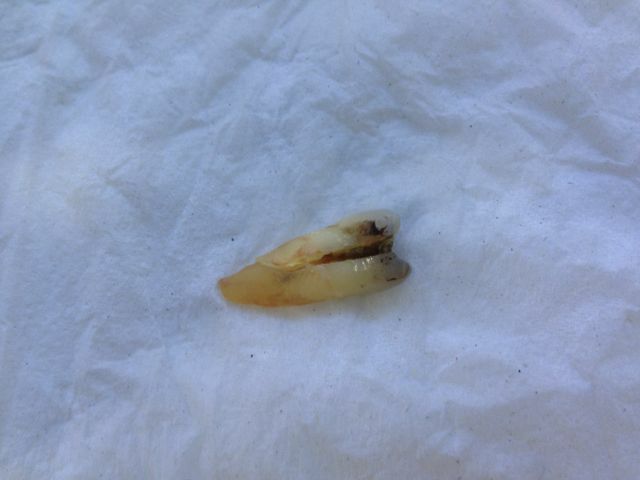 When I removed the tooth, it had a very bad smell. Now that the tooth has been removed, the infection in the gum will settle down. At other times, the crack in the root will be very obvious. 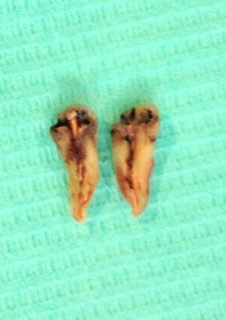 Here are some more cracked tooth root photos of a patient of mine. In the first photo below, the cracked tooth was supporting a bridge. 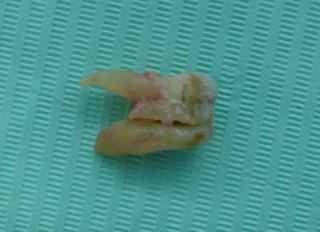 After removing the bridge, I was able to take out the broken tooth. 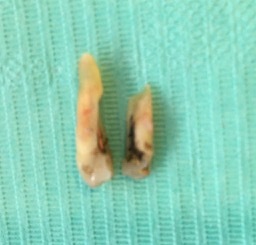 In the photo below you can see how the tooth was cracked clean in two! The mass of soft tissue between the roots was a reaction to the chronic long-term irritation caused by the crack. 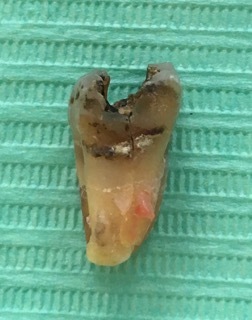 In the right-hand portion of tooth, on the right-hand side, you can make out the pink/orange root filling material that the tooth had been treated with. 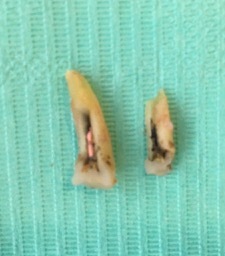 That root is also a little shorter at the tip, (at the top of the photo), as it had root canal surgery some years ago. 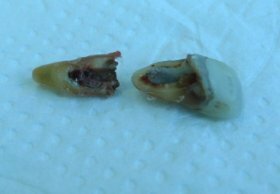 Here are some photos of an upper molar tooth that was painful to bite on, but there was no visible crack. 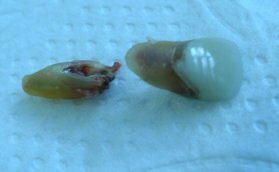 Now you can see that the tooth is split in half, from top to bottom. Ouch! Finally we can see that the tooth is completely broken, into two halves. There was no way of saving this tooth. 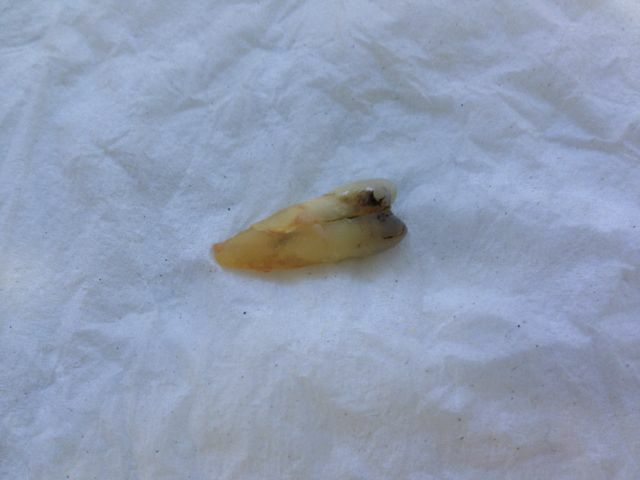 Here is another molar that cracked through one of the roots. In the first photo, it looks almost normal. In the next photo, you can see where the crack is. 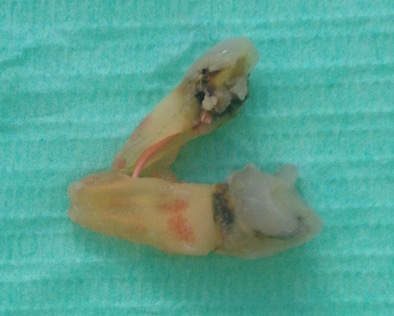 The photo below shows the cracked tooth root separated from the main part of the tooth. 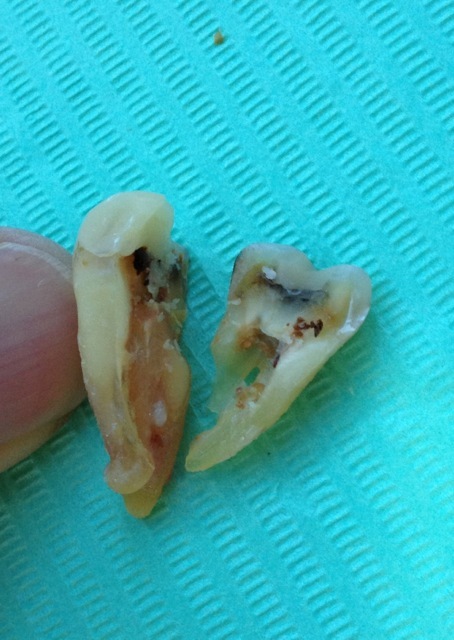 In this cracked tooth root photo, you can see that the tooth nerve in the middle of the tooth is exposed. 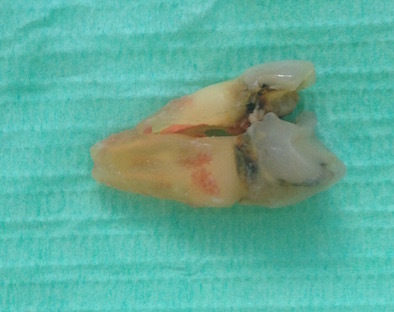 Here is a premolar tooth that had a very fine split down the root. This only became obvious after the tooth had been extracted. At first, the tooth looks normal. In this photo below we can see the suggestion of a crack in the root. In the next photo, below, we can see the crack becoming more obvious. And here the crack is fully obvious! So finally we see the full extent of the damage. 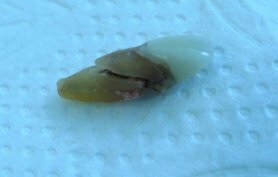 This tooth was shattered beyond repair. 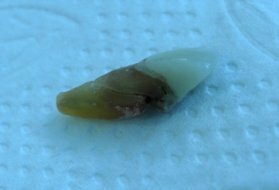 Here is another molar tooth that had a fine crack running vertically through the tooth, effectively splitting the tooth in two. 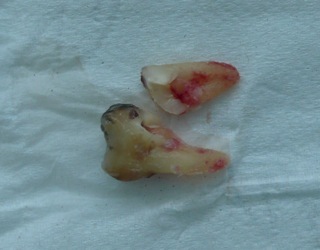 This was not visible at first, and only became obvious after the tooth was removed. 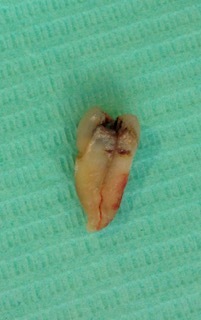 And yet another cracked tooth root - this one had been causing continued probems after root canal treatment. 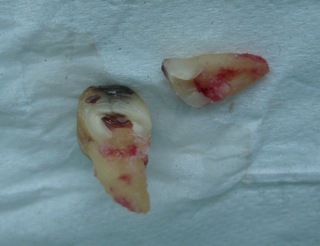 You can just make out the crack under the filling in these photos of the extracted tooth. 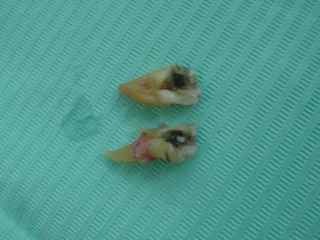 And finally the tooth falls into two parts. 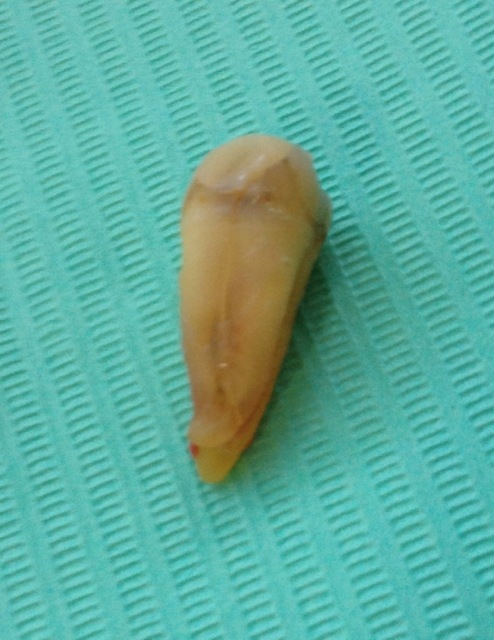 Again, the plastic root filling material is clearly visible in the lower half of the tooth. 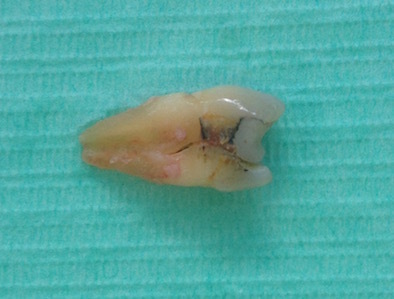 This first photo shows a molar tooth with a VERY UNUSUAL crack. 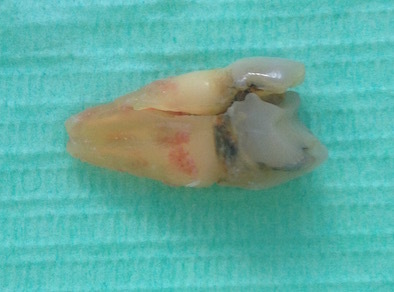 First of all, the metal filling had fallen out of the tooth, and the patient said he could feel part of the tooth moving. 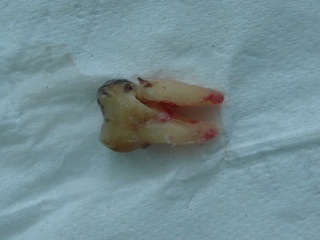 When I looked, the whole outer half of the tooth was wobbly. In the photo blow, the crack is not obvious. In the next photo below, you can see where the crack runs to - the very tip of the root!! 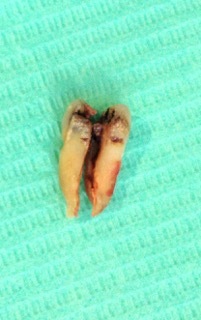 The last photo of this poor molar shows that it was completely split in two - unsaveable. In the photo above you can just make out the fracture line running from top to bottom. In the photo below the crack is a little more obvious. And in the picture below the crack has split the tooth apart, unfortunately. 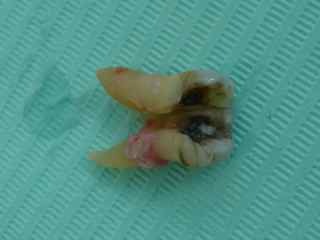 Below is the final photo of this shattered tooth. 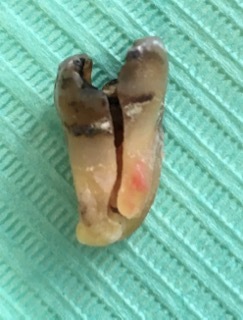 It also had a root filling inside the root, which is the pink plastic thing most visible at the top of the tooth. 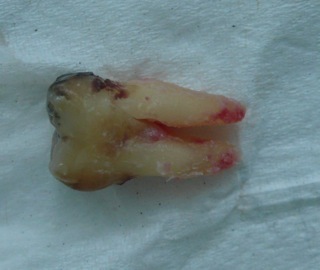 And here is my most recent cracked tooth root photo; The first photo shows the tooth after extraction. 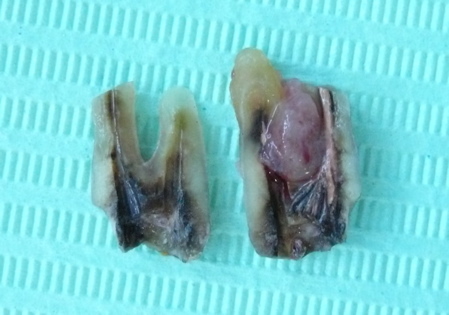 The final photo shows the extent of the damage, and the old root filling inside the tooth. 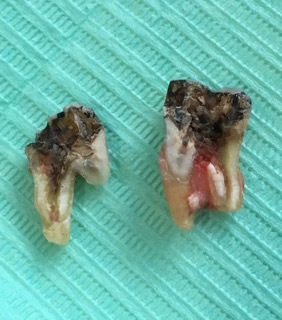 I hope that these cracked tooth root photos have shown you what can happen to a tooth even when there is no major decay. Like most things in life, a tooth can suffer a catastrophic failure. As you see, the only solution is removal. Sometimes, removing a cracked or split tooth can be difficult, as they may splinter or break up as the dentist tries to get a grip on it. At other times, removal can be relatively straighforward, because the split tooth has become loose in it's socket. There are several options for replacing a missing tooth. Take a look at this page to read about some possible options!